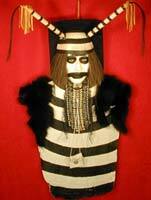 Native Americana Culture Cradle Boards, Peace Pipes, Rattles, Prayer Fans, Rain Sticks. Native American Masks - Here you will find masks by artist LaNeAyo and include a Lummi Traditional Dancer, a Cheyenne Dog Soldier, a Koshari Hopi Clown, and an Apache Scout. 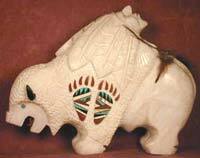 Native Americana Sculptures - Here you will find many beautiful sculptures by great artists like Leo Johnson, Ben Livingston, Ray Todacheeny, Orval Joe, Daniel Joe, Brian Begay, JC Joe, Susie Joe, and many more. Native American Weapons - Here you will find a large selection of weapons including Medicine Shields, Tomahawks, hatchets, Quiver & Arrows, War Clubs, Wooden Bows, Spears, Knives & Stands, and much much more. 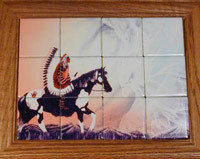 These beautiful Native American Tiles are hand painted by father and daughter, Bill and Tracie Rabbit.